As Detective Drexel Pierce struggles to overcome the mysterious death of his wife, the murder of a city alderman, Hal “the Bull” Nye, and its investigation threatens Pierce’s career. Found in his secure high-rise condominium, with no obvious mechanism of death, what killed the Bull may be as mysterious as who killed him. The lone clue that could expose the killer is a cryptic message burned into a desk. While Drexel’s commander pushes to arrest the Bull’s young girlfriend to please the politicians and media, he seeks out the truth, following a trail of mobsters, rivals, and pasts best forgotten. As the machinery of investigation closes in on the Bull’s young girlfriend, Drexel risks it all to save her and save his illusions of a society that believes in truth. The Shattered Bull is the first book in the Drexel Pierce mystery series set in modern Chicago with compelling characters and twists and turns along the way. Fans of Michael Connelly, Ian Rankin, and Ross Macdonald will love this introduction to a new mystery series. 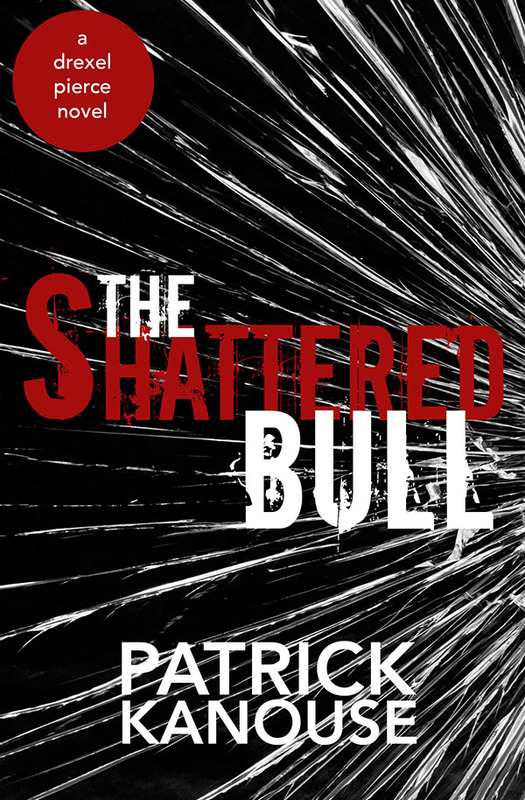 Get your copy of The Shattered Bull to discover this exciting new mystery series today. Praise for The Shattered Bull at Big Al’s Books and Pals. Detective Drexel Pierce closed the back door of the sand-colored Taurus. He swung the grey, canvas messenger bag over his shoulder and turned to face the Trump International Hotel and Tower as the blue lights of several patrol cars cast their illumination into the street, up the sides of the surrounding buildings, and across the faces of the half dozen police officers milling around. A slight breeze rolling eastward along Kinzie Street fluttered along his neck. The unseasonably warm January evening felt nice and bizarre after the past several days of near freezing temperatures. In the spaces between and above the blue flashing, the building was golden at 10:04 p.m. Numerous lights burst out of the lobby and a dozen hotel rooms in this newcomer of a skyscraper. Trump’s original plan had called for its glass and steel construction to be the tallest building in America. Until 9/11. Now it was second to Willis Tower in Chicago. Drexel let his eyes travel up the ninety-eight floors, which from the northern side rose straight up. The building had three setbacks aligned to other nearby buildings in an effort to have the tower merge into the skyline more readily. The two stories below each setback had more steel and brushed aluminum, while the rest of the floors had an overall blue appearance despite the visible steel spandrels. Just to the east, the Wrigley Building’s white terracotta facade. To the west stood the black-bronze IBM Building, the last American building by famed architect Ludwig Mies van der Rohe. Drexel took one of the four elevators. He leaned against the back wall as it rose to the penthouse and wondered at the wealth it took to live in this tower overlooking Chicago. He shook his head, unable to imagine it and not wishing to. If the cop all those floors down was right, Drexel hoped his case load would lighten. At the moment, he was working three active cases and one cold case from two years ago—each detective in Victor’s squad took one or two on to see if they could close them, though they usually remained cold. The other three were young men—boys really—gunned down on separate streets in East Garfield Park. Two were running away, bullets in the back. The other some rival had walked up behind the kid and put a twenty-two just in back of the right ear. None looked promising to solve. Assuming this latest vic or perp was the Bull, then the Chicago PD brass would want a full-court press on solving it. When the elevator dinged and opened onto the eighty-eighth floor, Drexel stepped out. Two uniformed officers stood in the foyer. One nodded when he saw Drexel’s badge hanging on a ball chain around his neck. He stepped under the yellow crime tape on the south side of the building and into Hal, “The Bull,” Nye’s condo, founder and owner of TG Enterprises, multimillionaire, alderman from the forty-second ward, and convicted murderer. From the entry, two hallways led left and right, and straight ahead three steps up into a gallery and spacious living room that looked southeast across Grant Park and onto Lake Michigan. The room smelled faintly of flowers, and two ferns either side of the doorway fluttered with his entrance. On either side of the gallery, a set of four black-and-white photographs on canvas made up a larger picture. The one on the upper right a rainy street scene with a Chicago cab’s rear driver taillight prominent. On the bottom right, the same scene but without the rain. The top left featured the upper portions of several brick buildings, but also with no rain. The bottom left featured the street level part of the buildings, wet with a heavy rain. The set reminded him of Zora’s artistic photographs, the ones she had done when not running around the city as a photojournalist. From the entrance, Drexel could see the living room had a light tan sectional sofa, matching chair, an end table on each side of the sofa, and a giant flatscreen TV. A large painting of abstract forms and swirls of colors dominated one of the walls. Two vases of white daisies sat on the pedestals. The long, straight black hair of a woman hovered above the back of one of the sofas as she faced the windows. One of the officers pointed Drexel to the right. He followed the officer’s gesture, past a coat closet and small bathroom and up two steps. At the top of the steps, two doors on either side, one of which exited the condo into a maintenance area and stairwell. The other opened into the family room, framed by double-doors. A set of deep brown leather sofas angled toward each other on a large circular cream carpet. The hallway narrowed, and on the walls, photos framed in ornate black wood with scrolls and wavy edges hung at the same height and evenly spaced. Drexel recognized the Bull’s face in several of them alongside a woman, much younger than him with burgundy hair, eyes large but not overly so, and a thin angular face. Drexel passed a door that led to another hallway and an open door to a short entrance that led to what looked like an office and through another door at the end of the hallway, where he could see activity. In the center of the room sat an exercise swimming pool, behind Drexel was a sauna and to the right of the pool was a hot tub. A treadmill and weight machine stood near the glass and along the room’s wall. On the long south wall, a large flatscreen TV and black-painted wood entertainment center. A door just beyond that led to what Drexel assumed was another room. The floor was a brown-striated, cream marble tile, a distinct difference from the dark, wide-planked hardwood Drexel had walked on in the hallway. Victor stood, holding a small cone paper cup from the water dispenser near the treadmill. The pool’s motor was churning strong currents. The captain maintained the swagger of his Marine days several decades in the past, talking with pride about the invasion of Grenada, which he reminded anyone who would listen was called Operation Urgent Fury. Near his feet lay a man clothed only in a pair of green swim trunks with white edging. A pair of blue flip-flops, one upside down, with the Chicago Bears logo lay three feet from the body. Victor looked at Drexel and gestured toward the corpse. “Welcome.” He pointed at one of the unis, pointed to the pool motor, and then slid his finger across his neck. The uni nodded and turned off the motor. The loud churning of water came to a sudden stop and the sound of waves diminished. Drexel looked at the body in front of him. The right hand reached toward the southwestern glass wall. The left hand lay alongside the abdomen. The right leg was bent in a natural way upward toward the chest and the left leg was straight. An epi pen lay beside the right hand, its needle exposed, the blue safety cap inches away. A bruise on the right thigh was visible. The left side of the face lay on the marble. The right eye and lips were swollen. “It’s the Bull. Don’t you recognize him?” Victor drank the last of the water, crumbled up the paper cup, and stuffed it into his coat pocket. Drexel looked at the body. The swelling nearly obscured the recognizable features. “We can’t touch him until Noelle gets here.” The hot tub had steam rising from its surface. On the edge, a faceted crystal glass with a deep golden liquid in it. A towel hung over the edge of the tub. Victor said, “Guessing bourbon.” He motioned to one of the CSIs to collect the glass. He also motioned to the towel that hung over the edge of the tub. A CSI walked up, her name tag read Daniela. “I’ve drawn one up already.” She lifted a notepad with a sketch on it. Drexel nodded, took the notepad, and turned back to Victor. “Looks like he was done exercising and about to enjoy a drink and soak. How do you want to treat this?” He ripped out the sheet and handed the notepad back. The entry to the office was a short hallway with a solid wall and a bathroom entrance. Embedded into the walls were portraits of the Bull, a bit below Drexel’s eyeline. The Bull with the mayor. The Bull at a party at the White House. The Bull in a single image with three women wrapping their arms around his neck, chest, or arm. The Bull at the stock exchange when TG Enterprises went public. In all, the Bull’s full head of blond hair, aquamarine eyes, and broad shoulders. As a felon, the Bull had been body-builder muscular, and, though he had not let freedom strip him of that physique, he nonetheless had softened. After his release from prison, the Bull formed an elite agency, representing actors, athletes, whoever could afford the fees: TG Enterprises. By all accounts, the Bull represented his clients by being both aggressive and well informed. They were locking down multimillion dollar deals or fees. However, before the high visibility world of rich athletes and actors, the Bull had started the company attempting to get more movie and TV studios filming in Chicago, easing the bureaucratic red tape, finding locations, and dealing with the unions. Chicago, always the third city after New York and LA, appreciated the spotlight by forgiving the man his sins. Working with the studios had led to agenting, and the Bull proved so adept that, in a couple of years, he had accumulated a fortune—despite having no training in the field. But his charisma and personal story had a resonance with others. Different stories built up. He was aggressive. He was intimidating. He was a diplomat. Whatever he did, it worked. The Bull more often than not got hefty paydays for his clients—and himself. The Bull also invested wisely, increasing his own personal fortune by choice stock decisions. That fortune only skyrocketed when he took TG Enterprises public. The Bull then turned his money on Chicago politics, winning his first election—albeit by a narrow margin. His popularity continued to grow and recent rumors had suggested a future mayoral run for himself. In the far corner of the office, a mahogany desk with gold inlays around the edges dominated. The desk was a touch of showy among otherwise sleek, unfussy decoration. The chair behind the desk was turned slightly from directly facing the desk, as if the Bull had left it without putting it back in its proper place. A large portrait of the Bull next to someone Drexel did not recognize filled the back wall. Another portrait of the Bull shaking hands with Michael Jordan burnished a corner of the desk. Beside that, a digital frame cycled through images, snapping the Bull’s toothy smile over and over. Drexel bent down and looked across the desk’s face. The “writing” rose just above the surface at the edges of the letters, as if one were looking at a 3D topographic map and the edge of the letters were mountains cutting across a vast plains area. Someone had carved the phrase into the wood and then put lighter fluid in the resulting crevices and lit it. A streak of soot diagonal to the rightmost letter of each word looked like the place someone set flame to the word. The message was meaningless to him if that meaning was beyond its obvious content. Drexel held his hand above the writing. It was cold. “I can see it if this writing was done after the fact. In anger or something. But not sure why?” Drexel took a deep breath and let it out. “Let’s see if there’s any prints on this desk. Dust the top and underneath the edging. Dust the chair and door as well.” He looked at Daniela and gestured lazily toward the door.